The county likes this because it means the Museum Center and the private operator assume any financial risks rather than taxpayers. The Museum Center likes it because it means work can begin more quickly, they'll have more cash up front, and they won't have to constantly come back to commissioners to approve every little detail. There was some disagreement during the regular commission meeting Wednesday. Commissioner Todd Portune objected to the resolution, not because he doesn't support the idea, but because he thinks it doesn't go far enough. "I want us to act on an agreement," he says. "And we can act on an agreement that is contingent upon the tax being approved by the voters." Commissioners Chris Monzel and Greg Hartmann argued that just isn't feasible exactly because voters have not yet approved Issue 8. "Any notion that we're going to enter into a contract on a $200 million plus renovation today, or even next week, is just not appropriate," says Hartmann. "It just doesn't give us the time to get that kind of agreement worked out." Issue 8 is the 5-year, quarter cent sales tax on this November's ballot that would be used to fund a large portion of the proposed repairs. Meanwhile, The Museum Center Board is moving forward. 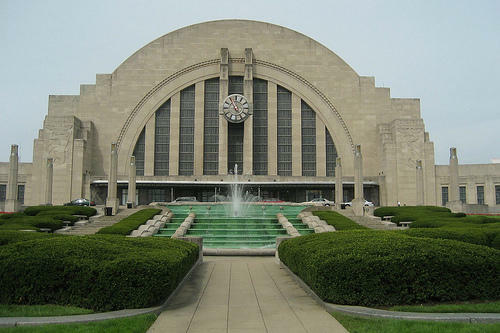 It's creating a Union Terminal project oversight board that will work with the county should the tax be approved.